Meet Nellie and Minnie Maus as they pose for their portrait at the studio of S. D. Joy in Lake Odessa, Michigan. It is uncertain which of these children is Nellie and which is Minnie because the person who wrote their names on the back of the photograph failed to include their ages or other identifying information. The baby in this image is sitting in a very ornate pram. 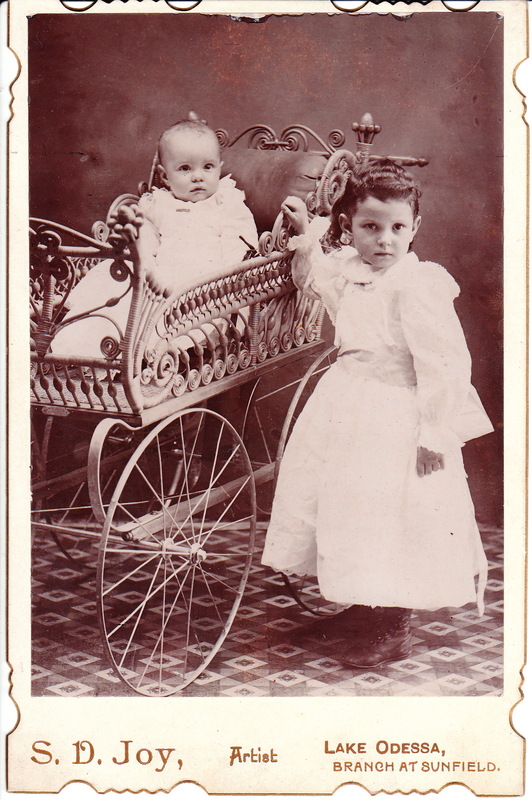 To view other turn of the century baby carriages, click on the category “Baby Carriages”. Unfortnately, Mickey Maus was unavailable when this cabinet card was produced. One can only assume that he was in California for a movie shoot or else he was bound by contractual obligations to not appear in any photographs except those published by the Walt Disney Company. Unfortunately, no biographical information about the Maus girls could be uncovered. The photographer, Sherman D. Joy appears in the 1930 census where he is listed as a 62 year-old photographer. He was married to Etta V. Joy.